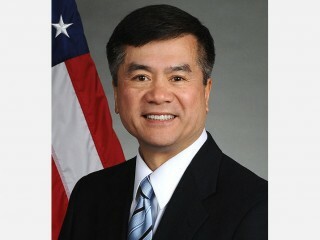 Gary Locke, born January 21, 1950 in Seattle, Washington, United States is an American-Chinese politician . He is the current United States Secretary of Commerce and was the 21st Governor of Washington, serving from 1997 to 2005. Locke was the first, and remains the only, Chinese American to serve as governor of a state in United States history. As the first Chinese American to head a county government in North America, Gary Locke seemed to be all things to all people: a visionary, a manager, and a leader. In his eleven years as a state legislator in Washington State, Locke earned a reputation for brilliance in budget-writing, for working sixteen-hour days, and for his obsession with detail. King County, encompassing the greater Seattle, Washington area, is an area where newer, affluent communities contrast with older urban neighborhoods and rural areas. As executive of this complex region, Locke grappled with the same issues facing many regional governments in the mid-1990s: managing growth, providing services to a burgeoning population, balancing the concerns of city and rural residents, of developers and environmentalists, and planning for the future. In 1996 Locke was elected to his first term of governor of the state of Washington; he was re-elected to a second four-year term in 2000. Being a legislator was easy, he said in an interview with Himanee Gupta. "All you had to do was know every line of the state's budget, work frantically for four months to get your bills passed, and go home." As county executive, however, Locke must set the government's vision, identify goals, and choose how to go about carrying them out. "I am impatient sometimes," he admitted. "I have to learn that change doesn't happen overnight." Locke's leadership skills passed a crucial test in late May 1994, when he was put in the position of bringing environmentalist and pro-growth forces together on the Seattle area's regional growth-management plan. After pondering the issue for months, Locke brokered a compromise that allowed some growth to expand into rural areas if developers also created a buffer of park land between urban areas and rural parts of eastern King County. The compromise, announced moments before elected officials from King County, Seattle, and the area's suburban areas were to start voting on new twenty-year growth-planning policies, stunned--and pleased--many observers. "You really have to give him credit for coming in and taking on an issue a lot of us have mulled over for years," longtime King County councilwoman Cynthia Sullivan told Gupta. "He brings a new perspective." Gary Locke was born January 21, 1950, in one of Seattle's poorest neighborhoods, the son of a Chinese immigrant mother and a World War II army combat officer. His father, James, owned a restaurant in the Pike Place Market and later a grocery. Locke grew up speaking Chinese at home, learning English only after starting kindergarten. A straight-A student and a Boy Scout, Locke went to Yale in the late 1960s to study political science. Though smart, he often felt out of place among his wealthier, blue-blooded classmates, and he found himself missing Seattle. Nevertheless, he graduated in 1972 and earned a law degree from Boston University in 1975. After earning his law degree, Locke returned to Seattle and took a job as a King County deputy prosecutor, which eventually led him into politics. He started out campaigning door-to-door for politicians such as future Seattle mayor Norm Rice, Seattle city councilwoman Dolores Sibonga and future congressman Jim McDermott. He found he liked the work, and after a 1981 staff job with the state senate's higher education committee, he was hooked. He ran for the state house of representatives in 1982, and came into office calling for reform in Seattle schools to improve education for poor and minority students. His colleagues recall that in his first years in the state legislature, Locke played the role of angry agitator, who often made enemies. Over time, he became known more as a consensus builder, who would fight for his bills aggressively and eventually pull all sides together to broker an agreement. Eventually, he rose to chair the powerful house appropriations committee, where he acquired a reputation for brilliance in budget-writing. He was widely seen as a rising star, possibly a future U.S Senate candidate or Washington State governor. Locke made his run for King County executive at a time when the county was gaining new clout and power. Before 1994, King County controlled a vast 2,200 square miles of territory but always seemed politically inept. A nine-member council set policy, tone, and agency. For eight years, Republican Tim Hill, Locke's predecessor, had entrusted the running of government to department heads. The region's real power base lay at Seattle City Hall. A vote to merge King County with Metro--which provides the area's bus and sewer services--changed that. The day Locke was sworn into office, county government grew from 7,000 to 11,000 people. The county council grew to thirteen members, giving suburban representatives a majority and clout for the first time. Locke was assigned the role of regional leader, a job second in power only to governor. Locke threw himself into office, becoming the region's leading decision maker. Yet, his critics chastised him at first for making decisions too slowly. Locke defended his pace, saying that his advisers suggested that he take things slowly, hire the right people, and get them working together. "Reshaping government takes time," he told Gupta. At the core of Locke's philosophy was a need to reach out to people that government had traditionally ignored. During his first six months in office he visited rural areas such as Duvall, a small community in the county's dairy lands, where local officials briefed him about road and bridge improvements, and the North Bend Senior Center where he promoted the idea of setting up offices in rural locations to make the county more responsive to all of its residents, who range from the rural, and largely conservative to the generally liberal population of the city of Seattle. Locke frequently talked about a Nordstrom-style government, referring to the department store chain famous for its exceptional customer service. Locke's way of adapting the Nordstrom philosophy to government was to treat people with respect and to make government more accessible to ordinary people. It seemed Locke's philosophy was working. In 1994, he successfully led the King County Council and area developers into a compromise which brought together pro-growth and environmental forces. In the agreement Locke and the other parties forged, developers would build on 325 acres of a 2,025-acre area, preserving the rest to open space. All sides were ecstatic with the decision. The compromise symbolized unity. County councilwoman Sullivan said at a press conference that she'd "rarely been prouder of an elected official than I am today of the County Executive." County councilman Larry Phillips, with whom Locke had had serious disagreements in the past, also was pleased, saying he was happy to see "a new way of doing business in King County." In 1996, Locke was elected governor of the state of Washington. In his election campaign, he chose to emphasize the values of his Asian culture, such as a strong commitment to education, rather than racial matters per se in his state where Asians only account for 6% of the population. Locke was re-elected in 2000. In his second campaign for governor, he promised to improve the state's education system, reduce traffic congestion and lower property taxes. He also vowed to replace 4,000 state bureaucrats with as many new teachers, and further promised to give teachers and principals the authority they needed to remove disruptive students. In December 2002, Locke became chairman of the Democratic Governor's Association, an organization made up of the 24 Democratic governors from around the country. His new position was expected to give him a louder voice in national politics. Education: Locke went to Yale in the late 1960s to study political science; he graduated in 1972 and earned a law degree from Boston University in 1975. Politics: The first Chinese American to head a county government in North America, Gary Locke must be all things to all people: a visionary, a manager, and a leader. View the full website biography of Gary Locke.